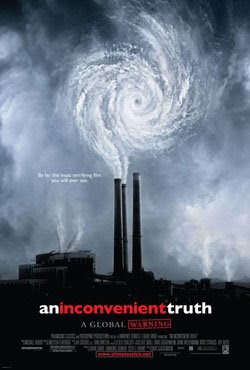 I watched An Inconvenient Truth tonight. Very well done, I highly recommend it. Watching it, though, I was really struck by how unconscionable it is that they've known about this problem for decades, and they've just sat on it, or worse, obstructed the path of people trying to fix it. An entire generation of people have stuck their heads in the sand rather than address the issue. Pathetic. Watching AIT just three years after its debut, it was interesting to see how prophetic it is. Gore talks about how naysayers have claimed we have to choose between the economy and the environment, and then shows a chart comparing Japanese and American auto companies to demonstrate that building fuel-efficient vehicles is economically beneficial. Flash-forward to the present day, and we know how well the American auto companies are faring! Global warming is real, and it's affecting our species' ability to live on this planet. What can you do? Well, as a unionist, I've seen and firmly believe in the power of people acting collectively. If we all do something, all our individual actions add up to something collectively huge. Some suggestions: Buy electricity from Bullfrog Power. Support environmental groups like The Bruce Trail Conservancy. Walk or bicycle instead of using your car. Vote for political parties (such as the NDP and Green) that will actually do something meaningful to protect the planet. There are tons of sites out there such as Lighter Footstep, One Million Acts of Green, TreeHugger, EcoGeek.org, and GreenLivingIdeas.com. Consult them, learn from them. Do something. Here's a summary of my green lifestyle choices that I created a while back.